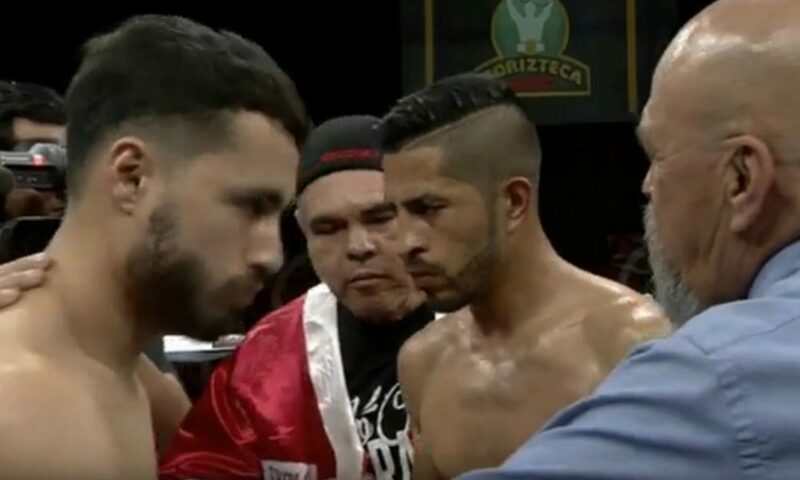 The most highly contested bout on Friday night had to be the six rounder between Jose Maria Carrillo (r) from Manteca Calif. and Eduardo Lopez Centeno (l) from Rosarito, B. C., Mexico. 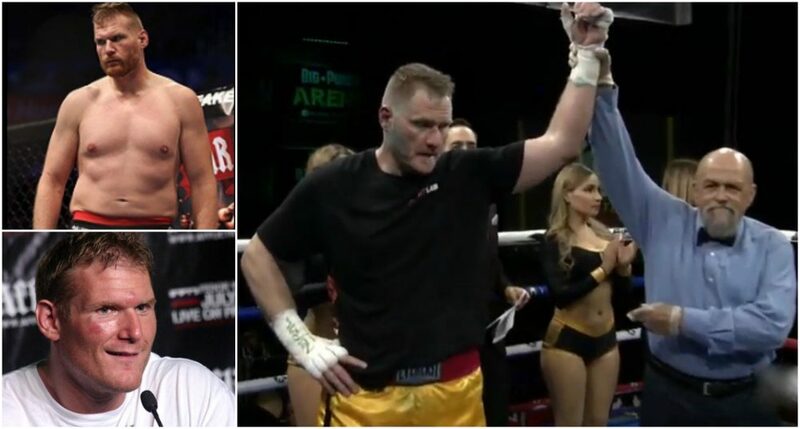 Just last week, boxing fans witnessed a slugest in Poland between Patryk Szymanski (19-2, 10 KOs) and Robert Talarek (24-13-2, 16 KOs) and in that fight there were 10 knockdowns in five rounds with Mr. Taralek eventually pulling off the upset. That’s what fight fans crave to see. 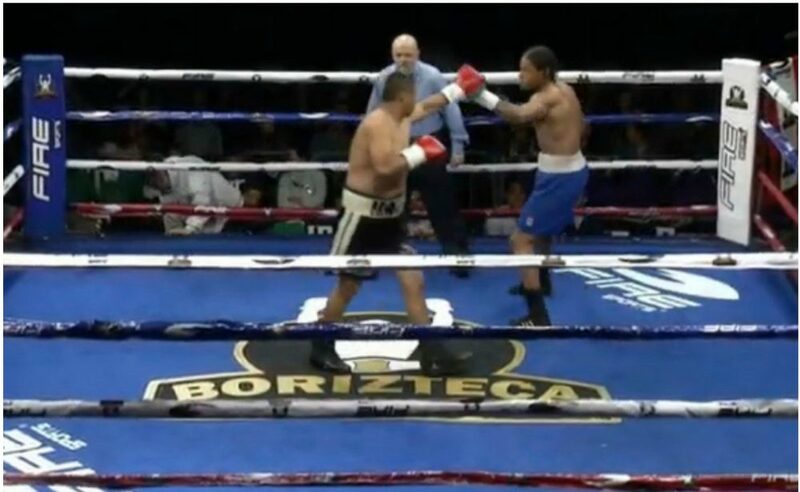 As a follow up to that fight, came this classic on Friday, April 12, 2019 at The Big Punch Arena on the latest Borizteca Boxing Promotion’s fight card. In their 5th bout of the night, these 5’6″ tall bantamweights went non-stop, toe to toe, in a most highly contested six rounder. 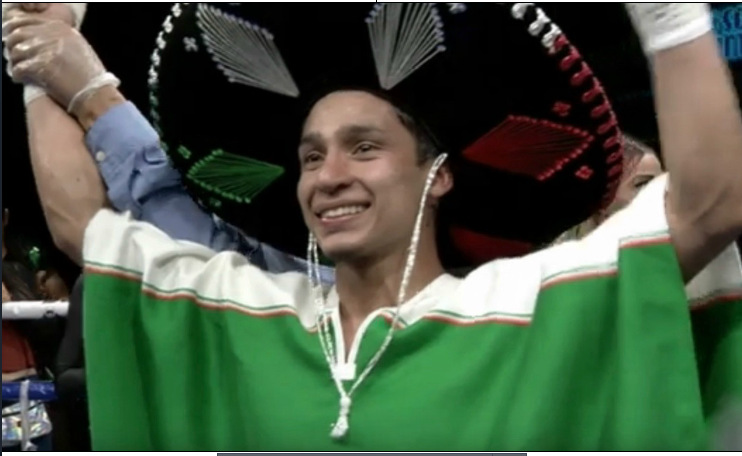 Jose Maria Carrillo (6-0-1, 6 KOs) Global ID 827428 came all the way from Manteca Calif., south of the border, to battle Eduardo Lopez Centeno (3-0) Global ID 843178 from Rosarito, B. C., Mexico. That means Carrillo and his troupe had to travel well over 500 miles to entertain the fans. While both young men threw caution to the wind, it was Carrillo who did the better job of slipping punches and managing his distance. His most critical period came when he twice switched to the southpaw stance. As a result of his switching, back and forth, righty to lefty, Carrillo got caught three times with solid left hooks. 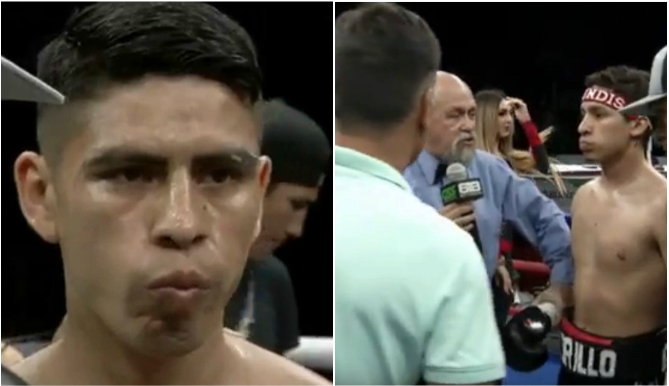 Midway throught this bout, we figure Centeno must have looked across the ring at Carrillo and felt as if he were fighting this octopus on steroids. 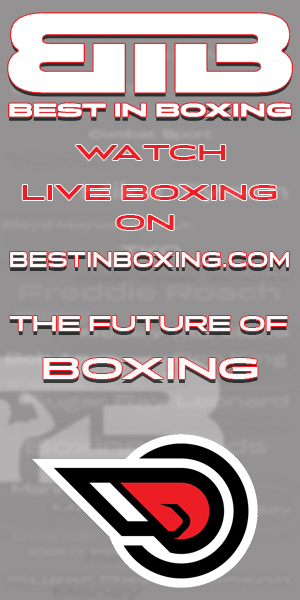 Carrillo’s conditioning was exceptional and his punches came at Centeno fast and furious from every angle. 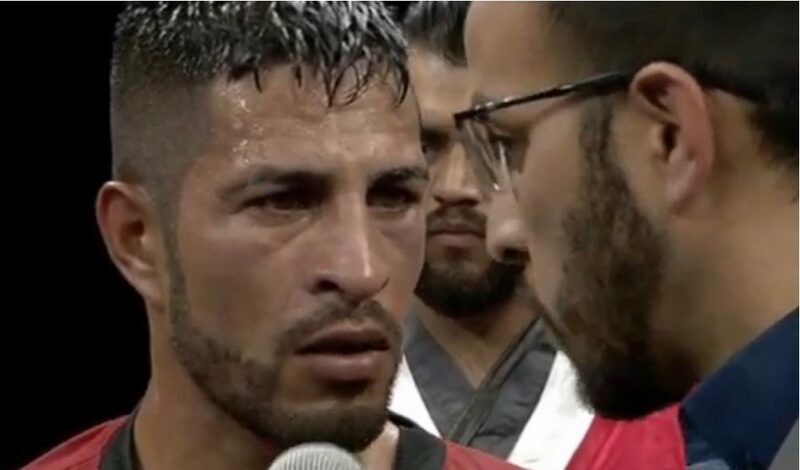 After covering a sport for 12 years, bouts like this remind you of a previous high, another extremely competitive match like the one in 2012 when Carlos “Baby” Castenada took on Luis “Pantera” Nery at Las Pulgas in downtown Tijuana. At that time, both young men were considered the very best in their weight class. Nery went on to win the match plus travel to Japan to become the Bantamweight Champion of the World. If Carrillo or Centeno continues to work hard, no doubt we’ll be getting to see them battle for a title. 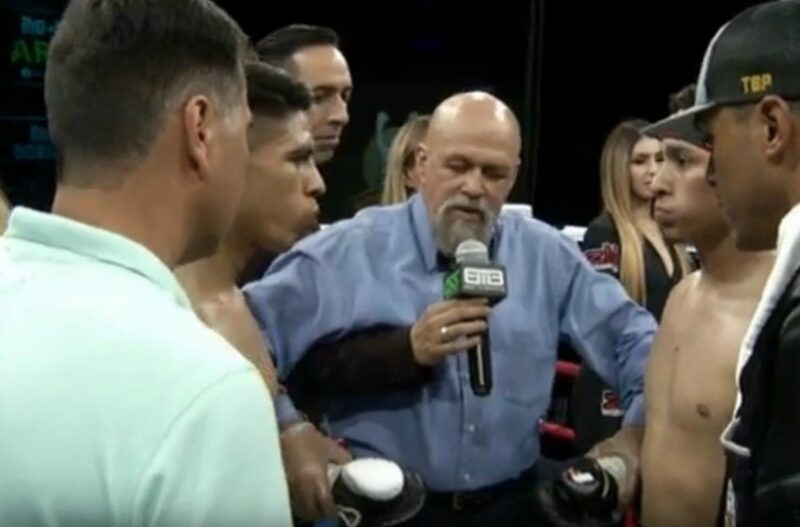 Here we see ring announcer Pablo Flores begin his announcement of the winner between Eduardo Lopez Centeno (l) from Rosarito, B. C., Mexico and Jose Maria Carrillo (r) from Manteca, Calif. 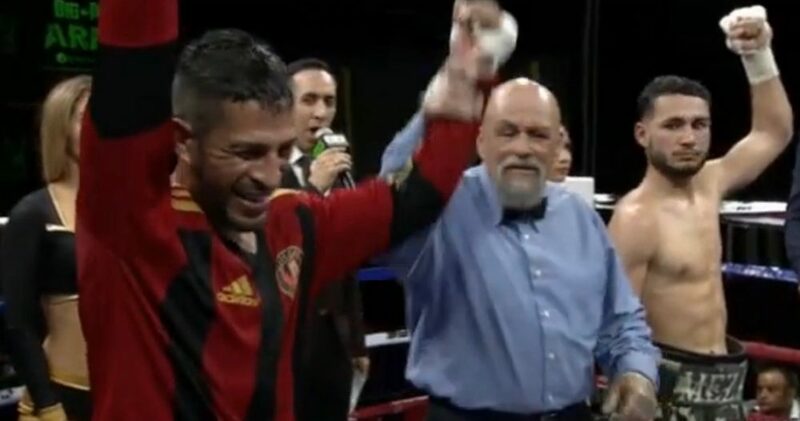 In this, the most entertaining “Bout of the Night” two of the judges scored the bout 58-55 for Jose Maria Carrillo while the third judge, who must have left his glasses at home, scored the bout 57-57 even. In the show’s opening bout, they featured the big boys, heavweight “Big” George Thompson (below, right), shown having his arm raised in victory by veteran, international referee Jose Cobian. 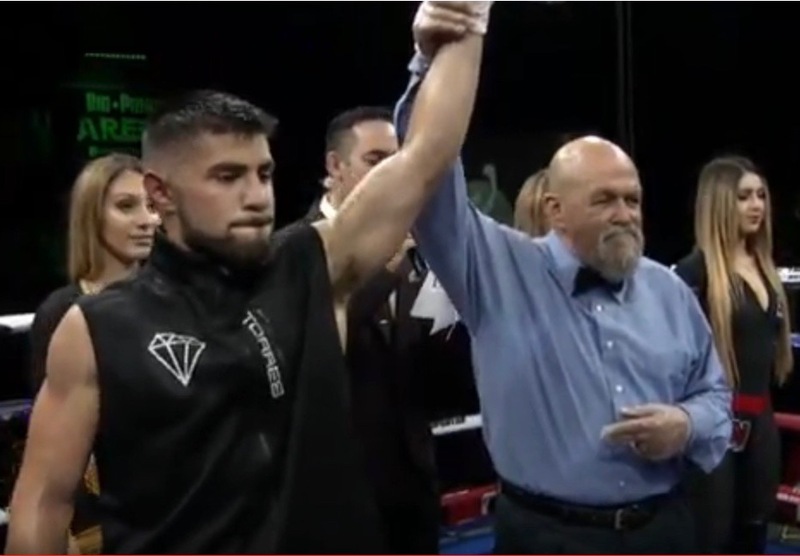 Thompson, Global ID 608194, 246.9 lbs., from Bellingham, Washington won a unanimous decision victory to improve to (3-3). With his marked resemblence to the MMA Champion Josh Barnett, we couldn’t possibly overlook this discovery. Thompson ended up pitching a shutout by imposing his roughhouse tactics on the shorter opponent Alejandro Garduno, Global ID 766140, 242.5 lbs. from Tijuana, who now drops to (2-13-2). Alejandro Garduno, Global ID 766140, 242.5 lbs. from Tijuana, who now drops to (2-13-2). 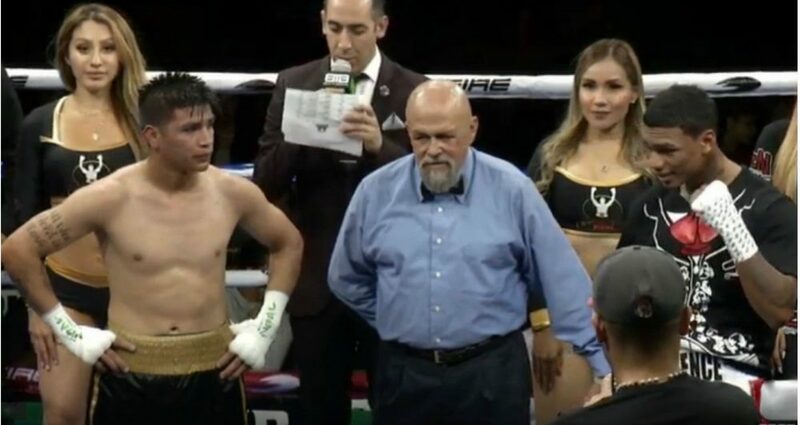 In Bout #2 they had the 23-year-old super featherweight Jose Eduardo Poom (2-18-1) blue corner, a victim of 10 KOs, Global ID 711604, from Empalme, Sonora, Mexico, going up against the more polished, 20-year-old standout Brandon Valdes (11-0, 6 KOs) red corner, from Barranquilla, Columbia, Global ID 750565. Valdes wasted no time and immediately went with the hard shots to the body before going on to land the cleaner, sharper punches to the head. 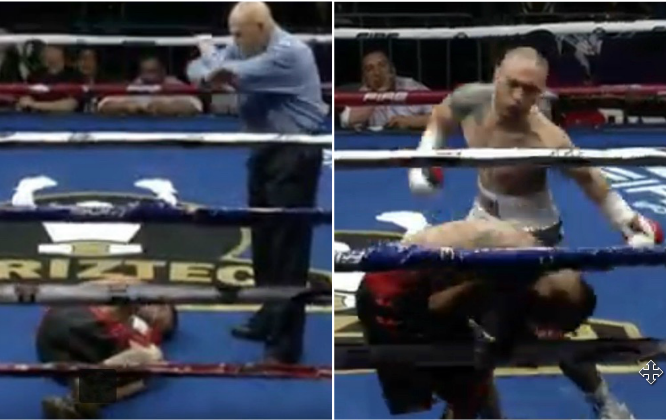 By round 3, Poom had found himself against the ropes and exposed. At that point, veteran referee Jose Cobian stepped in to make the necessary call and stop the bout. The fight was officially stopped at the 2.39 mark of round two. 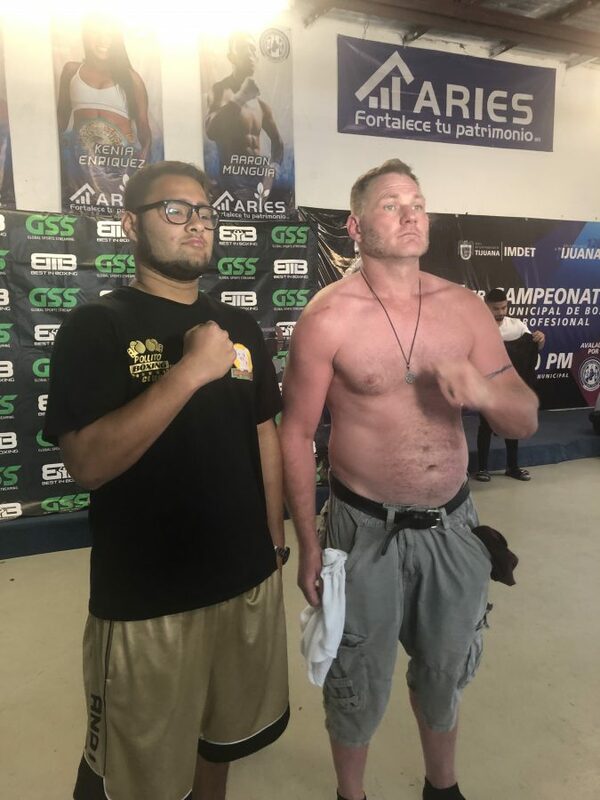 By this time, the boxers who had originally been scheduled to go first, Daniel Yocupicio (6-47-2) 180 lbs., black trunks, gold stripe from Navojoa, Sonora, Global ID 369004 and Christian Thomas (9-0) 178.5 lbs., blue trunks, white trim, from Las Vegas, Nevada, Global ID 825839 had made their way to the ring to touch gloves. On Friday, Thomas had a more pressing problem with this over-sized-yellow mouthpiece. On the Best In Boxing broadcast, Stand-up Comic/Ring Announcer Benny Ricardo suggested: “He must have borrowed that mouthpiece from Andrew the Giant!” Later in round three came another levity, “Not much landing in this round,” said Ricardo. 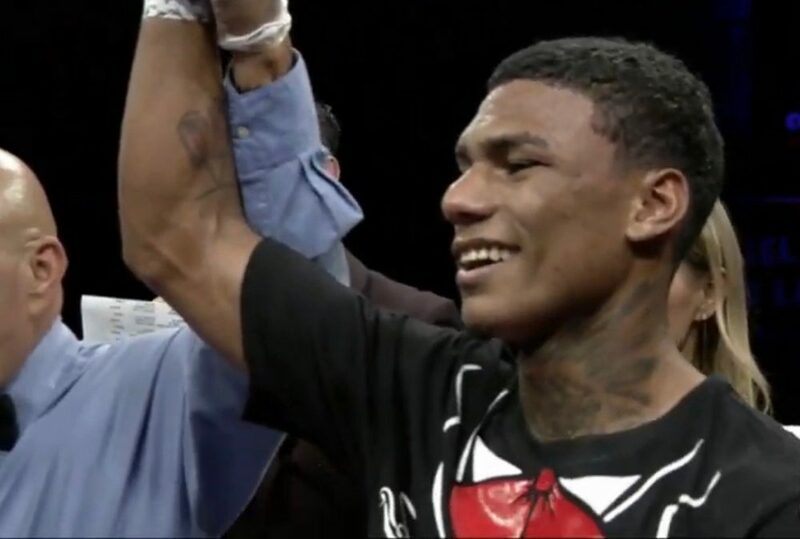 “They tried touching gloves and still missed.” When it got dirty at the end and the boxers added some wrestling, one fan brazingly yelled, “Hey Pitbull!” to Thomas’ opponent Yocupicio. 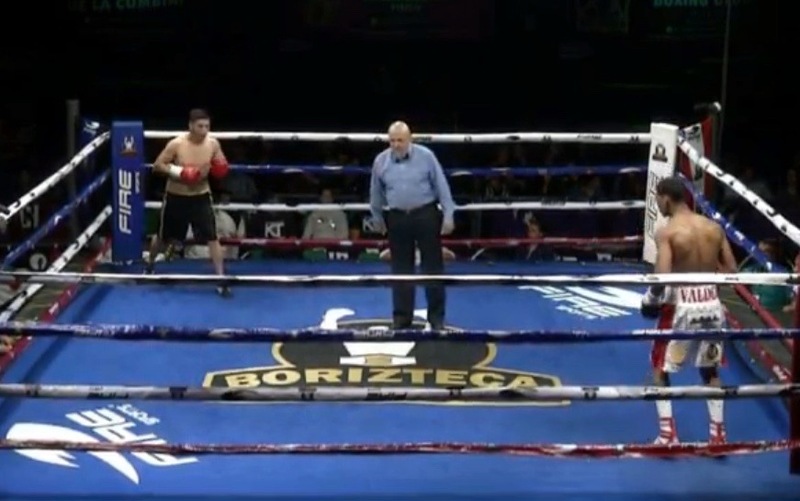 In Bout #4, they had Yahir Mendoza (r), Global ID 840060, from Navojoa, Sonora, Mexico (0-3) challenging Kevin “Diamond Boy” Torres, Global ID 775110, 11-1-1, 10 KOs both of whom had reportedly dropped 10 lbs. to make the lower weight class. It didn’t take long before Torres’ painful shots to the stomach, along with his right and left uppercuts had taking their toll. After an additional shot to the stomach and dealing with the pain, Mendoza finally waved the white flag. 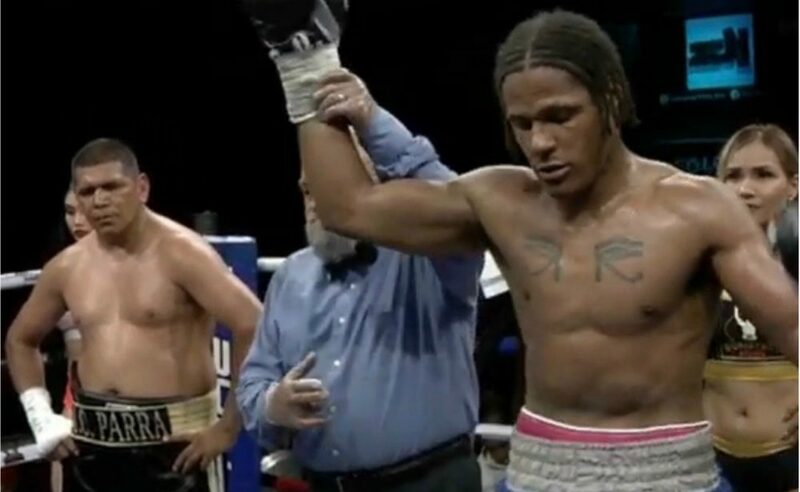 With the loss, Mendoza dropped to (0-4) while Torres improved to (12-1-1, 12 KOs). 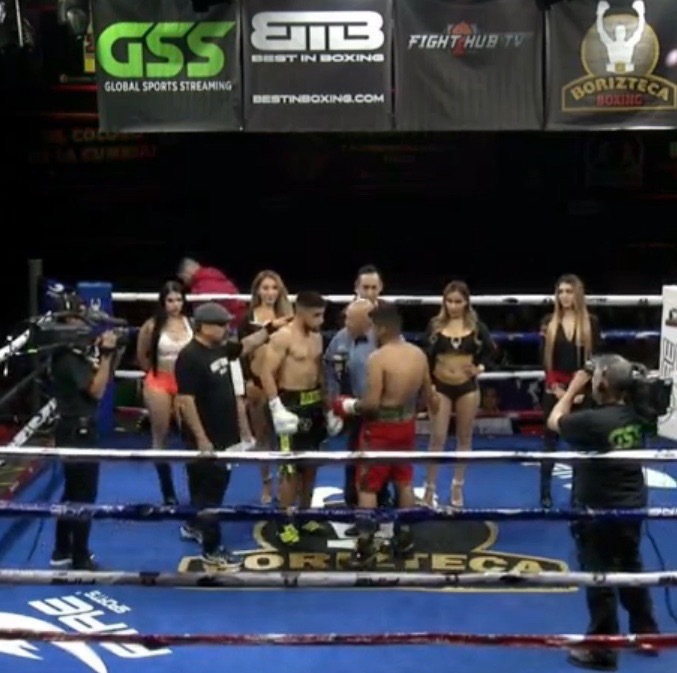 Skipping Bout #5 which we already covered, we move on to Bout #6, the 8 round Main Event, between superfeatherweights 22-year-old Roberto “The Ram” Meza Global ID 759481 from Temecula, Calif., 12-1, 6 KOs who was facing the wiley veteran 31-year-old Luis Angel “Bofo” Viedas Global ID 23-9-1, 8 KOs from Tijuana. Just prior to this fight, you couldn’t help notice the stern look on Angel Viedas’ face. There was no doubt concerning his intentions. Neither, Meza (l) or Viedas (r) looked all that cheery while referee Jose Cobian issued the pair their final instructions. The boxing match began to morph from a pushing contest into a wrestling contest. Again Ricardo fired off another salvo: “When they get in the kill zone, everything seems to stop.” In the final round, with everyone expecting the pair to battle all out, there were all these wasted movements and chances not taken. At the close of the match, the winner had truly become a mystery. 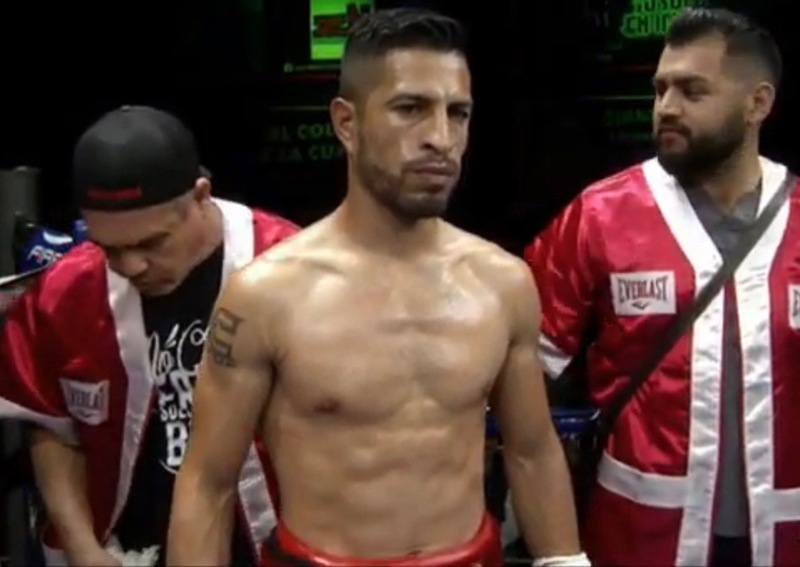 In the end, the final decision was awarded to Angel “Bofo” Viedas who at times must have been the busier fighter. 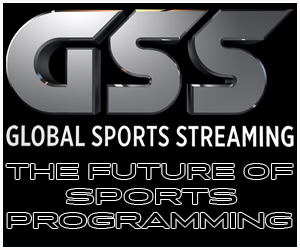 Here we see Angel Viedas sharing the proud moment with his coach Juan Jose Ramirez and (below) Viedas is interviewed for Global Sports Streaming’s Best In Boxing by former boxing standout Christopher Martin who coincidently will be hosting the Grand Opening of his brand new Boxing Gym at 4088 Bonita Road in Bonita, Calif. (Noon until 3 p.m. on Saturday, April 20, 2019). In Bout #7, they featured the ladies, 37-year-old Carina “La Reina” Moreno (24-6, 6 KOs) Global ID 200991 from Watsonville, Calif. (r), the former World Strawweight Champion who may have thought she was facing just another tune-up fight for her next run at a World Title. 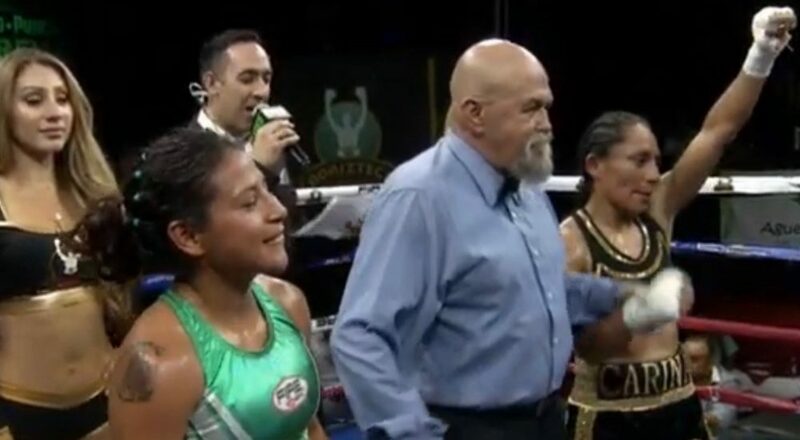 Her opponent was the happy-go-lucky, 29-year-old Cinthia Martinez (4-3-1) Global ID 662578 from Cancun, Quintana Roo, Mexico who put up quite a fight on her first trip to Tijuana. 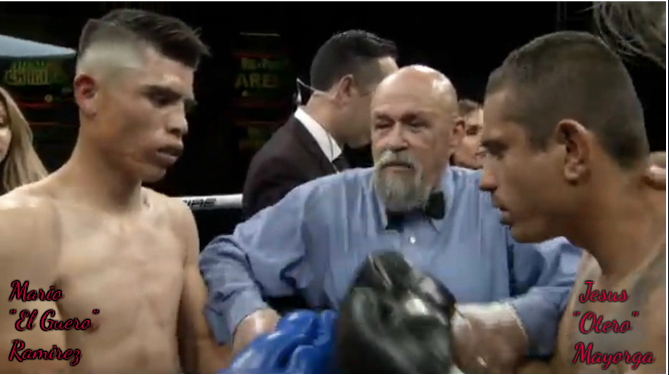 Martinez (l) performed well against the more accomplished, more experienced former World Champion. Even if the pair had been asked to go 10, or even 12 rounds, it’s likely Martinez would have still been standing there, trading punches. Even though Carina Moreno scored the easy victory, no one as of yet has been able to stop the durable Ms. Martinez. Bout #8 featured a six round super featherweight clash between southpaw Jesus Otero Mayorga (1-0-1) Global ID 870553 from Navojoa, Sonora, Mexico (right) facing local favorite Mario Alberto “El Guero” Ramirez from Camalu, B. C., Mexico (11-1-1) who was coming back to work after an eight month layoff to be with his wife while she had their first child. 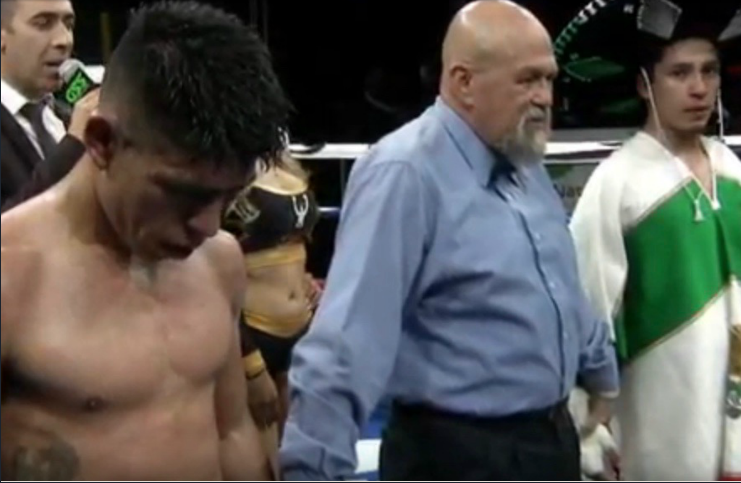 Mario Ramirez (left), now battling for an additional mouth to feed, wasted no time and went to work immediately while Otero seemed to hesitate and appeared content to lay back and be a counter puncher. As a result, the hard working Ramirez ended up securing a six round unanimous decision victory to improve to (12-1-1). 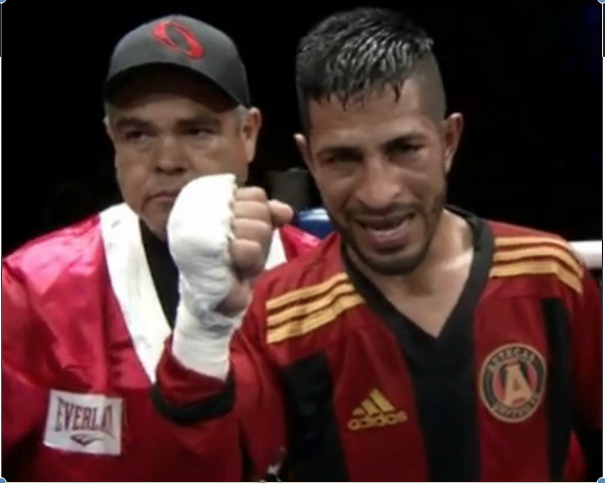 In the final bout, Bout #9, they featured a four round super featherweight match between 35-year-old Josue Banueles Global ID 835577, Record 0-3 from Tijuana (right) facing 29-year-old Giovannie “Golden Bear” Gonzalez (left) Global ID 791016, record 7-3, 6 KOs who hales from Stockton, Calif.
After being clobbered by Giovannie Gonzalez, Josue Banuelos wasted no time and went quietly into the night. This cover-up maneuver, unlike planking, has no chance of catching on. With the win, the “Golden Bear” improved his record to 8-3, 7 KOs.